We have already learned about compressive strength and tensile strength of concrete and methods of determination of such strength parameters. 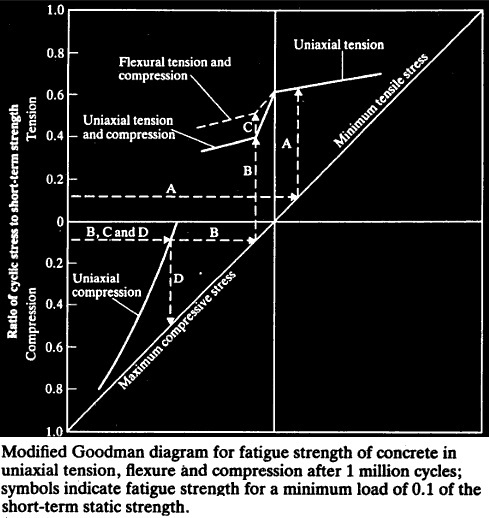 Here in this post we will discuss basics of fatigue strength of concrete. The elaborate discussion will be published later. Like other materials, concrete may subject to fluctuating loading and we all know. In case of arrival of loads in cyclic order, materials show less strength than in any other form. The fatigue strength of concrete is much less than that from static strength due to sustained loading. A fatigue limit of (50-60)% of compressive strength in static, is observed, when stress is applied in 2,000,000 cycle, for a maximum stress starting from zero. Modified Goodman diagram produce a reasonable estimate for ranges of stress. In case of stated above, the fatigue limit is also 55% of respective strength in static loading. Modified Goodman diagrams are only a general guidance. There have other factors which also influence fatigue strength of concrete like loading rate, age, and moisture condition. The explanation of this diagram with the description of symbols will be published later.